The Bar, under construction at the new LALLAgrill at Del Monte Shopping Center. The vertical garden that feeds the Lallagrill. Pub's Prime Rib in Salinas closed its doors for business. 16-inch elbow-length, Black. Available in Chef’s Line® Retail Packaging. CleanFish founders Dale Sims and Tim O’Shea along with CleanFish Culinary Director Polly Legendre will be guests on the KGO AM 810 program ‘Dining Around’ with Gene Burns, tomorrow Saturday, August 23rd, at 11am. They will be discussing all things fish including Nunavut Wild Arctic Char, a fabulous fish offered by the newest member of the CleanFish Alliance, the Inuit of Nunavut, Canada. If you live in the Bay Area, please tune in to KGO, AM 810. Otherwise, stream the show live from their website . Since its development in the 1940’s, PET’s excellent tensile, thermal, mechanical, optical and electrical properties have continue to earn it new markets. PET is the premium resin, on a per kilogram basis, of the “big six”. Properties: Transparent, strong and tough, PET offers both excellent gas and moisture barrier properties, and is resistant to heat, mineral oils, solvent and acids (but not bases). Widely used in fibers and films, PET is also available in a stiffer, semi-crystalline form for blow molded and thermoformed products. Applications: PET is used to make bottles for soft drinks, water, liquor, mouthwash, peanut butter, edible oils and salad dressing, as well as many other food and non-food containers. Good heat resistance means it can be used in ovenproof films, microwaveable food trays and boil-in bags. It is also used to make audio and videotapes, many injection-molded consumer products, textiles, fiberfill insulation, electrical components, some auto parts, and strapping and molding compounds. When made into a fiber, the resulting clothes are crease resistant. Recycling: Clean flakes and pellets or recycled PET are used to spin fiber for carpet yarns and backing, and produce fiberfill clothing and geotextiles. Other products made from recycled PET include non-food bottles and containers, boat hulls, paint-brush bristles, cassette cases, scouring pads, office binders and furniture. Harder, stronger and a little heavier than LDPE, and with even better chemical resistance, HDPE is used to make pipes, sheet products, films and bottles. Properties: HDPE is strong, resistant to moisture and most chemicals (except ones with aromatic or chlorine content), and relatively stable when heated. However, it is permeable to gas. Lusterless and translucent when unpigmented, pigmented bottles generally have better stress, crack and chemical resistance than unpigmented HDPE bottles. The resin can be easily processed and formed; it can be welded together, but is difficult to glue. HDPE is available in either flexible or semi-rigid forms. Applications: HDPE is used to make bottles for milk, juice, water and laundry products, as well as yogurt containers, margarine and ice cream tubs, cereal box liners, drums and other containers for many kinds of household and industrial chemicals, the “crinkly” kind of shopping and trash bags, reusable crates and pallets, children’s toys, sporting goods, and many other products and packages. Recycling: Products made from recycled HDPE include liquid laundry detergent and motor oils bottles, drainage pipe, recycling binds, trash cans, drums and pails, reusable shipping pallets and dairy crates, floor tiles, benches and picnic tables, plastic lumber and various kinds of fencing. A cost-effective substitute for many scarce natural materials, PVC products are equally at home on the construction site and the operating theatre. PVC resins are the most versatile, in terms of both application and processing, of any of the “big six). PVC can be compounded with a large variety of additives to form products that range from rigid rain gutters to flexible cable insulation. It’s also one of the least expensive resins. Properties: Shiny, tough and moderately strong, PVC plastics are available in clear, translucent and opaque forms. Exceptionally resistant to grease, oil and most chemicals (although not all solvents), PVC is reasonably stable and stands up well to the weather, especially when formulated with certain additives. Chemically inert and nonflammable, it has good UV resistance, but has a limited operational temperature range and starts to decompose at 100º C. Both rigid PVC and, through the addition of softeners, flexible PVC products are available. Of particular interest in some applications, the resin will not kink if bent. Applications: PVC is used in clear food packaging, bottles for mineral water, cooking oil, liquor, mouthwash, shampoo, cosmetics and other personal care products, as well as many of the familiar blister packs. Any clear, colorless bottle not made of PET is likely made of PVC. The resin is widely used in the construction business to make pipes and fittings, siding and cladding, floor coverings, carpet backing, roof gutters and windows. Other applications include PVC blood bags and hoses, wire and cable insulation, toys, shower curtains, pool liners and other sheeting products, coatings, synthetic leathers and vinyl furniture covering, credit cards and many more product lines. Recycling: Products made from recycled PVC include packaging, binders, decking, paneling, garden hoses, drainage pipes, mud flaps, sheeting, flooring and tiles, cable, traffic cones and speed bumps, mats, and so on. LDPE offers a unique combination of properties: toughness and high impact strength, high gloss and clarity, good heat stability and chemical resistance, low permeability to water, outstanding electrical properties, flexibility and processibility. Properties: Strong but lightweight, LDPE is easy to process, use and seal. It has excellent insulating properties, and provides a good barrier to water, moisture and most organic chemicals (except ones with aromatic or chlorine content). Although not as stiff and strong as HDPE, LDPE is more flexible and offers better impact resistance. LDPE is opaque except in the thinner films and foils. Applications: LDPE is used to “shrink” wrap thousands of consumer products and make various foils, trays and bags – the soft kind that do not crackle – for both food (milk pouches, and bread, sandwich and frozen food bags) and non-food items (most soft plastic shopping bags, as well as dry cleaning and trash bags). The more rigid form is used in an assortment of flexible lids and squeezable bottles. The resin is also used as a protective coating on paper, textiles and other plastics (for example, in milk cartons), as a chemically resistant lining, in wire/cable and electrical/electronic applications. Recycling: Products made from highly recyclable LDPE include shipping envelopes, film and sheeting, garbage can liners, floor tiles, paneling, compost bins and trash cans, trash bags and grocery sacks, irrigation pipes, plastic lumber and so on. From fibers to flexible packaging to car bumpers, polypropylene is one of the most versatile resins. Relatively inexpensive, easily modified to meet a wide range of thermal and mechanical requirements, and suitable for virtually all kinds of processing equipment, PP has found many applications both within and outside the packaging field. Properties: A light, ductile material – PP has the lowest density of the major packaging polymers – the surface can be soft and scratches easily. Though not as strong as some other polymers, PP can be strengthened and stiffened using various additives. The resin is usually white and opaque, but can be colored. It offers reasonable resistance to the weather, and has exceptional resistance to moisture, oil/grease, acid, bases and some solvents. Similar to HDPE, PP is stiffer, lighter, strong, and can withstand higher temperatures. It also shows good fatigue resistance which means it can be used for hinged caps. Copolymers may be needed to survive cold conditions, and stabilizers added for UV protection. Applications: Packaging applications include ketchup bottles, yogurt containers, margarine tubs, caps and lids, the wrappings used on cigarette packs and candies, and some pourable containers (like syrup jugs). A high melting point makes PP ideal for hot beverages. It’s also used to make drinking straws, storage boxes and bins, tanks, suit cases, appliance housings, housewares, cassette holders, and battery casings. PP fibers are used in rope and twine, carpeting and carpet backing, monofilaments, and broom fibers. PP copolymers and used in pipes, containers, boat hulls, seat shells and automotive parts. Recycling: Product made from recycled PP include auto battery cases and cables, signal lights, brooms and brushes, ice scrappers, oil funnels, landscaping borders, bins and pails, recycling containers, pallets, sheeting and geotextiles, trays, etc. Very popular since its development in the 1930’s, polystyrene is prized for its transparency, thermal stability, lightness, excellent electrical properties, ease of fabrication, and low cost. Properties: Hard, rigid and almost glasslike (though readily colored), PS is brittle and more easily broken than some other polymers. A very versatile and easy-to-process resin, PS can also be used in its lightweight expanded form to make a number of foam products. Not particularly weather resistant, so not usually suitable for outdoor use, PS is resistant to water, oxygen (but not carbon dioxide), acids, bases and detergents. However, it dissolves in almost all solvents. When modified by elastomers, PS becomes high impact polystyrene (HIPS) with even more applications. Applications: PS is used to make drinking glasses, hot beverage cups and plates, trays and lids, clear carry-out food containers, medicine bottles, and (in its expanded form) grocery store meat trays, egg cartons, foam “clamshell” containers, and preparation cups for instant soups and noodles. It is also used in protective packaging (such as CD and cassette covers), cutlery, tape reels, razors and housewares, glazing and light diffusers, and disposable medicalware. HIPS is used for casings, cups and take-out containers. PS is also widely used as a structural or insulating foam and expanded into beads for packaging and cushioning. Recycling: Products made from recycled PS include thermal insulation board, egg cartons, office equipment and accessories, packing “peanuts” and molded protective packaging, light switch plates, toys, reusable cafeteria trays, and so on. This coding means the product is made of another resin than the six listed above, or is composed of more than one resin used in combination. Properties: The properties exhibited will depend on the type or mix of resins used. Applications: Food product packaging made from other resins include three and five-gallon reusable water bottles, as well as some citrus juice and ketchup bottles. Recycling: A number of custom products and plastic lumber is made from assorted or mixed plastics. The heating value will depend on the type or mix of resins. covers the entire surface of the pear. Seckel pears are the smallest of all commercially grown pears. Sometimes called “sugar pears,” they are also the sweetest. Seckel pears are a great snack-sized fruit to be added to children’s lunch boxes or bags. They are also small enough to be canned whole. A small half seckel pear also makes an attractive plate garnish. Seckel is an American pear distinct in type from any European variety. Living in Philadelphia, toward the close of the eighteenth century, Dutch Jacob was a well-known sportsman and cattle dealer. Every autumn, upon returning from his hunting excursions, he would give gifts of pears to his neighbors of exceedingly delicious flavor. The tree they were harvested from he kept secret. Dutch Jacob eventually purchased the land that this tree grew on near the Delaware River. He eventually sold the land to Mr. Seckel, who gave the pear his name and introduced it to the public. The Seckel ripens in October, it’s size is small. The skin is smooth, dull; color yellowish-brown, lightly marked with pale russet and often with a lively russet-red cheek; dots numerous, very small, russet or grayish; flesh white, with a faint tinge of yellow, slightly granular, melting, buttery, very juicy; sweet, with an exceedingly, rich, aromatic, spicy flavor; quality very good to best. 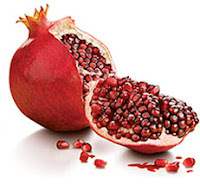 Origin: The pomegranate is native from Iran to the Himalayas in northern India and was cultivated and naturalized over the whole Mediterranean region since ancient times. It is widely cultivated throughout India and the drier parts of southeast Asia, Malaya, the East Indies and tropicl Africa. The tree was introduced into California by Spanish settlers in 1769. In this country it is grown for its fruits mainly in the drier parts of California and Arizona. Adaptation: Pomegranates prefer a semi-arid mild-temperate to subtropical climate and are naturally adapted to regions with cool winters and hot summers. A humid climate adversely affects the formation of fruit. The tree can be severely injured by temperatures below 12° F. In the U. S. pomegranates can be grown outside as far north as southern Utah and Washington, D.C. but seldom set fruit in these areas. The tree adapts well to container culture and will sometimes fruit in a greenhouse. is rich in potassium, full of nutrients and high in antioxidants. Fresh Pomegranates are available in September through January. Pomegranate concentrate is also available throughout the year. eaten fresh. The flavor is more of an apple than a date. Add jujubes to sautéed vegetables for an unusual and delightful taste experience - very popular in Chinese cuisines. The jujube originated in China where they have been cultivated for more than 4,000 years and where there are over 400 cultivars. The plants traveled beyond Asia centuries ago and today are grown to some extent in Russia, northern Africa, southern Europe, the Middle East and the southwestern United States. Jujube seedlings, inferior to the Chinese cultivars, were introduced into Europe at the beginning of the Christian era and carried to the U. S. in 1837. It wasn't until 1908 that improved Chinese selections were introduced by the USDA. 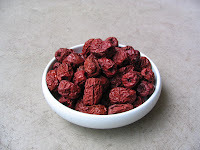 The jujube can withstand a wide range of temperatures; virtually no temperature seems to be too high in summertime. Winter dormancy allows it to withstand temperatures to about -28° F, yet it requires only a small amount of winter chill in order for it to set fruit. The plant revels in summer sun and heat, with the lack of either limiting fruit production more than winter cold. Yet jujubes have fruited in the Puget Sound and low Cascade regions of Washington State as well as in Pennsylvania. 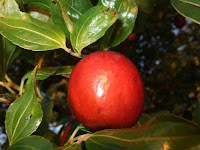 Fruiting of some cultivars has also been reported in northern Florida.The Indian jujube, which is more sensitive to frost, is grown in Florida, but the fruit is considered inferior. Jujube trees are not particularly suitable for container culture, but can be grown in this manner in a large container. 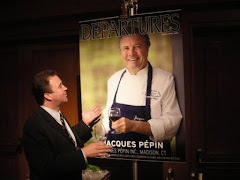 The following is a list of the Monterey executive chefs and their California Wild Rice recipes. These recipes and more may be found at www.cawildrice.com along with mouth-watering photographs of each dish by Patrick Tregenza. 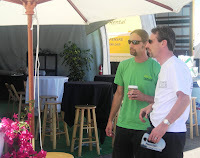 Executive Chef Dory Ford Sets Up The Sustainable Cafe At The 2007 Red Bull Races In Monterey. but cooking is a trade. I'm sorry, but it's a blue-collar job," says Dory Ford, executive chef for the Portola Restaurant and Cafe and in-house catering service at the Monterey Bay Aquarium in a recent article at US News and World Report. According to a survey of 1,730 kitchen professionals released in May by the industry insider website StarChefs.com, the average starting salary for a line cook in 2007 was $13.07 an hour, while the average salary for an executive chef was $77,611. In 2007, executive sous chefs earned an average of $55,679, sous chefs $42,104, and pastry chefs $53,017, according to the survey. 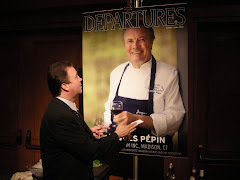 Executive chefs at country clubs or private dining operations earned the most of those in the categories surveyed (an average of $87,068 a year), followed by hotel executive chefs ($86,066), fine dining executive chefs ($78,348), and upscale casual executive chefs ($69,708). Longevity is the key to bringing in those top salaries. Of those surveyed, chefs averaged between 15 and 20 years in the industry, while executive chefs earning six figures had more than 24 years of experience. "When I think about modern cooking school education, I've got young kids getting out of school carrying $60,000 in debt and they come into my office and I tell them, '$9.50 to $10 an hour to start.' And they're being told by cooking schools they'll start out making $15 an hour," Ford says. Ford says he was expelled from cooking school because he worked too many hours at an outside job. He is now pursuing his master's certification from the Culinary Institute of America. Ford says he has talked some people out of going to cooking school and recommends that anyone who wants to get a culinary school education, to work in the industry first. If school isn't your thing, you can still obtain knowledge by taking specific classes in sauces, charcuterie, pastry, or the like, he says. "I have had [culinary] students who have done well and those who didn't do well, and I've had employees with no experience do well. It's all about individual personality," Ford says "I look for passion, whether they've gone to school or not, because then I know they will pay attention, that their answer will always be, 'yes, chef.' "
Sponsored by Raley's and Nob Hill Foods. This year's secret ingredient was mushrooms with, of course, liberal use of garlic. Waller, assisted by sous chef Saul Romero, prepared pancetta wrapped petite filet (of beef) with butter roasted Portobello mushrooms topped with garlic Parmesan gratin and red wine sauce; and wild mushroom and porcini mushroom and Parma ham stuffed chicken breast coated with Dijon mustard and rice flour, served over roasted corn/garlic/wild mushroom cream sauce. The four-chef battle included another local entry, Mark Ayers of the Highlands Inn and Hyatt Regency Monterey, as well as Christophe Preyale of the Fountaingrove Golf & Athletic Club in Santa Rosa and Ryan Scott of San Francisco's Mission Beach Cafe. Action took place in front of an audience on the festival's famed Cook-Off Stage. They had one hour to prepare, plate and serve their creations to a select panel of judges Iron Chef style. 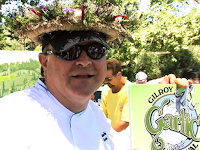 The Gilroy Garlic Festival announced an attendance of 107,553 for the three-day event which concluded July 27 at Christmas Hill Park. The figure represents an eight percent increase over last year. Additionally, Festival revenue, which benefits over 160 local non-profit organizations, was up over six percent from 2008. Included in this amount was the sale of 10,618 servings of garlic fries on Gourmet Alley. Carmel Plaza and Monterey County Vintners & Growers Association present Jazz at the Plaza, a 12-week concert series! Join us at Carmel Plaza for our annual Jazz at the Plaza 12-week series. Every Friday evening, a local band and local winery will be featured. For more information, please call Carmel Plaza's Concierge Center at (831) 624-1385. Fresh Sockeye Salmon is not around for very long ( ending in late August ). The sockeye salmon (Oncorhynchus nerka), often referred to as "red" or "blueback" salmon, occurs in the North Pacific and Arctic oceans and associated freshwater systems. This species ranges south as far as the Klamath River in California and northern Hokkaido in Japan, to as far north as far as Bathurst Inlet in the Canadian Arctic and the Anadyr River in Siberia. Aboriginal people considered sockeye salmon to be an important food source and either ate them fresh or dried them for winter use. Today sockeye salmon support one of the most important commercial fisheries on the Pacific coast of North America, are increasingly sought after in recreational fisheries, and remain an important mainstay of many subsistence users. General description: Sockeye salmon can be distinguished from Chinook, coho, and pink salmon by the lack of large, black spots and from chum salmon by the number and shape of gill rakers on the first gill arch. Sockeye salmon have 28 to 40 long, slender, rough or serrated closely set rakers on the first arch. Chum salmon have 19 to 26 short, stout, smooth rakers. Immature and prespawning sockeye salmon are elongate, fusiform, and somewhat laterally compressed. They are metallic green blue on the back and top of the head, iridescent silver on the sides, and white or silvery on the belly. Some fine black speckling may occur on the back, but large spots are absent. Juveniles, while in fresh water, have the same general coloration as immature sockeye salmon in the ocean, but are less iridescent. Juveniles also have dark, oval parr marks on their sides. These parr marks are short-less than the diameter of the eye-and rarely extend below the lateral line. Breeding males develop a humped back and elongated, hooked jaws filled with sharp caniniform teeth. Both sexes turn brilliant to dark red on the back and sides, pale to olive-green on the head and upper jaw, and white on the lower jaw. Life history: Sockeye salmon are anadromous: they live in the sea and enter freshwater systems to spawn. After hatching, juvenile sockeye salmon may spend up to four years in fresh water before migrating to sea as silvery smolt weighing only a few ounces. They grow quickly in the sea, usually reaching a size of 4 to 8 pounds after one to four years. Mature sockeye salmon travel thousands of miles from ocean feeding areas to spawn in the same freshwater system where they were born. Little is known about the navigation mechanisms or cues they use on the high seas, although some evidence suggests that they may be able to use cues from the earth's magnetic field. Once near their natal freshwater system, sockeye salmon use olfactory cues to guide them home. Like all Pacific salmon, sockeye salmon die within a few weeks after spawning. Maturing sockeye salmon return to freshwater systems from the ocean during the summer months, and most populations show little variation in their arrival time on the spawning grounds from year to year. Freshwater systems with lakes produce the greatest number of sockeye salmon. Spawning usually occurs in rivers, streams, and upwelling areas along lake beaches. The female selects the spawning site, digs a nest (redd) with her tail, and deposits eggs in the downstream portion of the redd as one or more males swim beside her and fertilize the eggs as they are extruded. After each spawning act, the female covers the eggs by dislodging gravel at the upstream end of the redd with her tail. A female usually deposits about five batches of eggs in a redd. Depending upon her size, a female produces from 2,000 to 4,500 eggs. Eggs hatch during the winter, and the young sac-fry, or alevins, remain in the gravel, living off the material stored in their yolk sacs, until early spring. At this time they emerge from the gravel as fry and move into rearing areas. In systems with lakes, juveniles usually spend one to three years in fresh water before migrating to the ocean in the spring as smolts. However, in systems without lakes, many juveniles migrate to the ocean soon after emerging from the gravel. Sockeye salmon return to their natal stream to spawn after spending one to four years in the ocean. Mature sockeye salmon that have spent only one year in the ocean are called jacks and are, almost without exception, males. Once in the ocean, sockeye salmon grow quickly. While returning adults usually weigh between 4 and 8 pounds, weights in excess of 15 pounds have been reported. In some areas, populations of sockeye salmon remain in fresh water all their lives. This landlocked form of sockeye salmon, called "kokanee," reaches a much smaller maximum size than the anadromous form and rarely grows to be over 14 inches long. Food habits: While in fresh water, juvenile sockeye salmon feed mainly upon zooplankton (such as ostracods, cladocerans, and copepods), benthic amphipods, and insects. In the ocean, sockeye salmon continue to feed upon zooplankton (such as copepods, euphausids, ostracods, and crustacean larvae), but also prey upon larval and small adult fishes (such as sand lance), and occasionally squid. Fisheries: The largest harvest of sockeye salmon in the world occurs in the Bristol Bay area of southwestern Alaska where 10 million to more than 30 million sockeye salmon may be caught each year during a short, intensive fishery lasting only a few weeks. Relatively large harvests of 1 million to 6 million sockeye salmon are also taken in Cook Inlet, Prince William Sound, and Chignik Lagoon. All commercial Pacific salmon fisheries in Alaska are under a limited entry system which restricts the number of vessels allowed to participate. Most sockeye salmon are harvested with gillnets either drifted from a vessel or set with one end on the shore, some are captured with purse seines, and a relatively small number are caught with troll gear in the southeastern portion of the state. Sockeye salmon are the preferred species for canning due to the rich orange-red color of their flesh. Today, however, more than half of the sockeye salmon catch is sold frozen rather than canned. Canned sockeye salmon is marketed primarily in the United Kingdom and the United States while most frozen sockeye salmon is purchased by Japan. Sockeye salmon roe is also valuable. It is salted and marketed in Japan. There is also a growing sport fishery for sockeye salmon throughout the state. Probably the best known sport fishery with the greatest participation occurs during the return of sockeye salmon to the Russian River on the Kenai Peninsula. Other popular areas include the Kasilof River on the Kenai Peninsula as well as the various river systems within Bristol Bay. Subsistence users harvest sockeye salmon in many areas of the state. The greatest subsistence harvest of sockeye salmon probably occurs in the Bristol Bay area where participants use set gillnets. In other areas of the state, sockeye salmon may be taken for subsistence use in fishwheels. Most of the subsistence harvest consists of prespawning sockeye salmon, but a relatively small number of postspawning sockeye salmon are also taken. Personal use fisheries have also been established to make use of any sockeye salmon surplus to spawning needs, subsistence uses, and commercial and sport harvests. Personal use fisheries have occurred in Bristol Bay, where participants use set gillnets, as well as in Cook Inlet and Prince William Sound, where participants also use dip nets. While most sockeye salmon production in Alaska results from the spawning of wild populations, some runs have been developed or enhanced through human effort. Although artificial propagation of sockeye salmon has proven difficult, notable success has been achieved at state-maintained hatcheries located on the upper Copper River in Prince William Sound and the Kasilof River on the Kenai Peninsula. A fish ladder installed on the Fraser River on Kodiak Island has also served to enhance sockeye salmon returns.